Hello Jaime Jo! Thank you for coming to Fueled by Faith and Caffeine. It is a pleasure to have you here. Thank you so much for having me! It's a pleasure to be here. As a writer, I’d imagine you read voraciously as well. What are some of the books you’re reading now? You’re reading many wonderful titles and authors. Speaking of books, congratulations on winning the 2018 Christy Award for The House on Foster Hill. Could you share what this book is about? The House on Foster Hill really plays off the age-old question: If walls could talk, what stories would they tell? It’s a story for our plight to find hope in tragedy and unresolved darkness. It follows the lives of two women whose lives run parallel in time and how the story of an unsolved, unidentified murder victim not only binds them together but takes them on a journey into dark depths only to prove that even in the deepest shadows, hope still grows. I love that, even into the darkest depths you can find hope. Your books reference the writings of Edgar Allan Poe. As a mystery writer, what inspires you about Poe’s works? I love his depth. Truly, he’s remarkably creepy and often twisted but woven through his horror-writings are the deeper questions of philosophy. Love, loss, grief . . . it’s all there. I have a feeling Edgar was an emotionally haunted man. I must agree with you, Poe is a poignant writer. Since my blog names caffeine in the title and you Jaime Jo, are a professional coffee drinker, what’s your favorite coffee, and do you drink it while writing? I have a litany of “favorites”. I enjoy a good strong San Francisco blend or a nuttier version like a Macadamia Nut. Yes. I always drink coffee while writing. It’s my muse. They both sound delicious, I love that coffee fuels your writing. I’d like to talk with you about your second novel, The Reckoning of Gossamer Pond. It is a story of danger and peril for the characters souls. What are several of the characters faith qualities you see in yourself? Strangely, I relate a lot to Jacobus Corbin. He intermixes a lot of deep philosophy and theology into his thought process and that’s how his decisions are made. I find myself doing that a lot. Where my faith and beliefs are deeply tied together with everyday life. 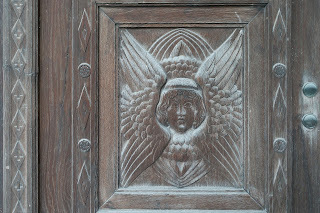 I can see that in your novels, they tie faith and philosophy together beautifully. 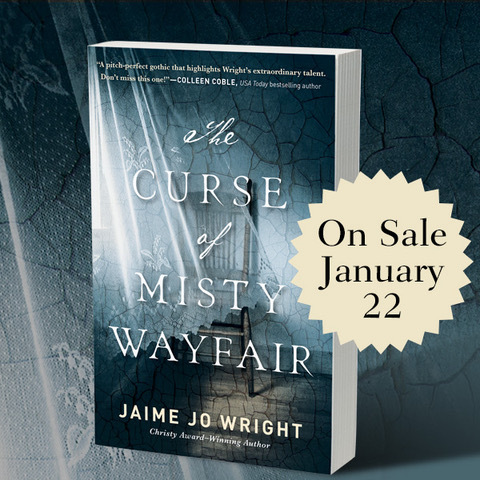 I’d imagine your third novel, arriving tomorrow, January 22nd, The Curse of the Misty Wayfair touches on this too. I’m looking forward to reading it as are many other of your readers. Can you give us a hint as to what this story is about? Yes!! It is about a legendary ghost that supposedly haunts the old logging town of Pleasant Valley. Interspersed in this Northwoods, quaint town, one also would find an abandoned asylum with its own book of secrets. The story is strongly threaded with themes of identity and self-worth as it explores mental illness and other conditions. And of course, there’s the always present question of who is going to die next? I’m curious to hear about how you write your fascinating novels. Do you use the experiences you’ve read about as a starting point for your novels? Or the settings from your home state? Experiences, sometimes. I’ve never actually discovered a dead body before, (lol! ), but a lot of the day to day settings and experiences are ones I relate to, for sure. As for settings from my home state of Wisconsin? Absolutely! All my towns are fictional, but they’re usually based on a real location. I keep intending to leave Wisconsin for another state in one of my stories, but I’ve yet to branch out. Many readers out there are also writers. What one thing would you advise newer writers to do when they start out? Do not pause. I think too often, newer writers pause their writing to study books on skill, or to become inspired, or even to wait for God to lay a story on their heart. None of those things is bad, in and of themselves, but it’s critical to keep writing while doing those. Even if what you’re writing isn’t the book/story you end up pouring your heart into. That practice is remarkably critical to growth as a writer. Remarkable, advice, thank you. I can’t help but ask, what books will we your readers see in the future from you? I just finished my next release entitled Echoes Among the Stones. It will go through a pretty rigorous editing phase now, and while I work on those, I’ll be starting a new story that is yet to be titled and still in development stages. I enjoyed meeting you Jaime Jo and am thrilled to read your upcoming release The Curse of Misty Wayfair. Thank you for spending time with us. 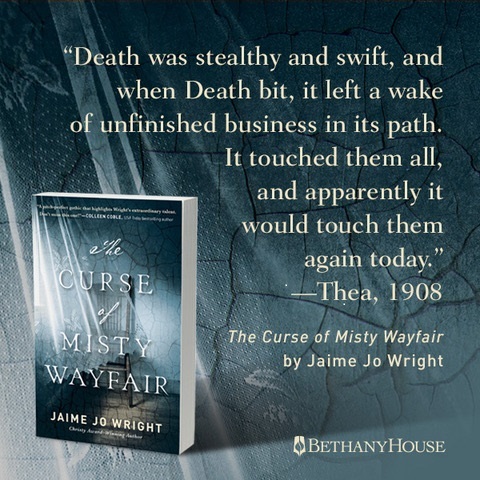 Friends, we are fortunate that Jaime Jo has agreed to share an excerpt from her soon arriving novel, The Curse of Misty Wayfair. 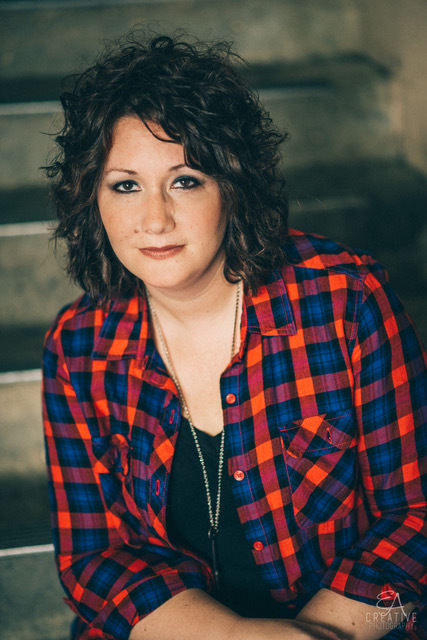 Wonderful interview with Jaime Jo Wright! The Curse of Misty Wayfair is amazing! I am already getting excited for her next release coming out in December! Oh, wow! What an engaging interview. Loved the advise to new writers. It applies to us all. I feel as if I need her in person. Thanks Stacey. Nice interview, Stacy. Your questions are so well put. And I love getting to know another coffee drinker. Hmm, there seems to be a theme lately! Hi Barbara! Thank you. It was a thrill to have Jamie on the blog. We coffee drinkers have to salute one another: ) Have a great night!